The “Sabre Twins” have graduated and are moving on in separate directions. Almost. Victoria (Col ’13) and Brittany Maiden (Col ’13), the so-called Sabre Twins, prepare for the twirling world championships. You may encounter dancing robots in the lab of engineering professor Amy LaViers, who studies human movement to improve robotic applications. 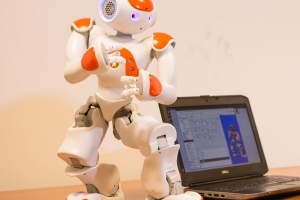 In her lab in UVA’s Olsson Hall, Amy LaViers, assistant professor in systems and information engineering, can make robots dance. 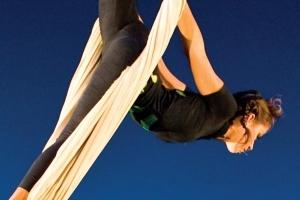 Aerial balletics were on display in one of the many arrestingly choreographed pieces in "Strands in Motion," a fall dance concert that showcased original work by both faculty and students.